"There was a time, and it was many years ago now, when I had to stay in a hospital for almost nine weeks. This was in New York City, and at night a view of the Chrysler Building, with its geometric brilliance of lights, was directly visible from my bed. During the day, the building’s beauty receded, and gradually it became simply one more large structure against a blue sky, and all the city’s buildings seemed remote, silent, far away. It was May, and then June, and I remember how I would stand and look out the window at the sidewalk below and watch the young women — my age — in their spring clothes, out on their lunch breaks; I could see their heads moving in conversation, their blouses rippling in the breeze. I thought how when I got out of the hospital I would never again walk down the sidewalk without giving thanks for being one of those people, and for many years I did that — I would remember the view from the hospital window and be glad for the sidewalk I was walking on." 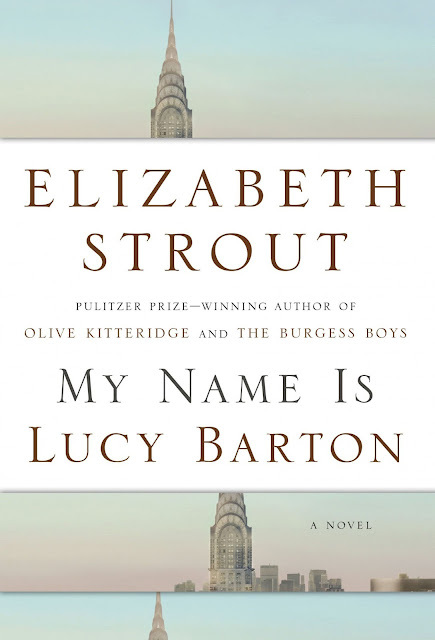 In My Name is Lucy Barton, Pulitzer Prize winner Elizabeth Strout tells a beautiful story of identity, loneliness, childhood trauma, mother-daughter relationships, and pursuing your dreams. That sounds like a lot to cover in one novel--and it is--and yet Strout has deftly managed to infuse these profound themes into a 200-page novel. This book is refreshing. Refreshing in its style, its control, and its ability to present the reader with deeply profound issues without hitting you over the head with their significance. Despite its short length, the story is complex. In its deceivingly simple prose, Strout infuses emotional gravitas that stay with the reader far after the book's cover has been closed. It's clean, modern, and lovely. The entirety of the narration takes place during Lucy Barton's extended hospital stay. Because her husband claims to have a great distaste for hospitals, he sends Lucy's mother to come for a few days and keep her company. Lucy hasn't seen her mother in years and aches for her company. Strout has a gift for capturing lifelike conversation and human interaction. The dialogue between Lucy and her mother is natural and relatable, and yet through these simple chats gossiping about what's happened with people in their hometown, Lucy learns about her mother, yearns to hear her say, "I love you," and has several flashbacks about her childhood. Having grown up poor, Lucy remembers years spent living in a garage, the ostracism she faced from kids her age, her mother's attempts to take in sewing to support the family, the hours she spent at school just so she could be somewhere warm, and the traumatic memories of what once happened with her father. Lucy's marriage is crumbling, her health is suffering, and her dream of becoming a writer feels far away. "I was lonely. Lonely was the first flavor I had tasted in my life, and it was always there, hidden inside the crevices of my mouth, reminding me." "This is a story about love, you know that. This is a story of a man who has been tortured every day of his life for things he did in the war. This is the story of a wife who stayed with him, because most wives did in that generation, and she comes to her daughter’s hospital room and talks compulsively about everyone’s marriage going bad, she doesn’t even know it, doesn’t even know that’s what she’s doing. This is a story about a mother who loves her daughter. Imperfectly. Because we all love imperfectly. But if you find yourself protecting anyone as you write this piece, remember this: You’re not doing it right." "When I am alone in the apartment these days, not often, but sometimes, I will say softly out loud, 'Mommy!' And I don’t know what it is—if I am calling for my own mother, or if I am hearing Becka’s cry to me that day when she saw the second plane go into the second tower. Both, I think. But this is my story. And yet it is the story of many. It is Molla’s story, my college roommate’s, it may be the story of the Pretty Nicely Girls. Mommy. Mom! But this one is my story. This one. And my name is Lucy Barton." Strout's prose in My Name is Lucy Barton is a modern-day resurrection of Virginia Woolf's To the Lighthouse and Mrs. Dalloway: an insight into a woman on a seemingly average day realizing who she has become and who she wants to be.